So it's quite likely that you may have seen our funky YouTube movie adaptation ads. If you haven't you can see all of them HERE! Well it's time for round 2! We're looking for the most epic and imaginative love scenes and film romance suggestions, which we can make into more cool tech adaptation ads for everyone to see! All you have to do is upload a picture of your scene suggestion either through Facebook, Twitter or Instagram. You can enter as many scenes as you wish and there are no restrictions to who can take part in this promotion. Entries will be taken between the 10th and the 20th of February. Vote for your favourite entries from the 21st until the 27th! We will be announcing the winners on Tuesday the 28th of February. The top 10 entries with the most votes will be in with a chance to win our 1st and 2nd prize of £150 and £50 respectively (or local currency equivalent) in CeX vouchers. The winning suggestions will also get the chance to be made into our shiny new tech themed adverts. 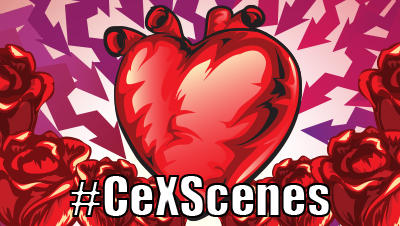 Head on down to our Facebook page and check it out, or tweet your favourite scenes to @CeX with #CeXscenes or on Instagram with #CeXscenes.